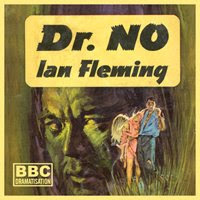 Following on from yesterday’s post about Bond audiobooks, today I thought I’d look at a BBC radio dramatisation of Dr. No. For those who missed it last year: Description from CBn. Ian Fleming’s James Bond will be licenced to thrill in a brand new BBC Radio 4 dramatisation of the author’s sixth book and first film of the cinematic series, Dr. No, planned for April 2008. As one of the many events celebrating the centenary of 007’s creator, this Dr. No dramatisation will star Die Another Day villain Toby Stephens as James Bond, David Suchet as Dr. No, Janie Dee as Miss Moneypenny, Jordanna Tin as Miss Taro and many more actors. Eon Productions, the owner of the James Bond rights, gave permission to do this one-off, once-and-once-only dramatisation to mark the Fleming centenary provided they were given casting approval of the role of Bond—luckily, Stephens was the number one choice for all involved. This Dr. No dramatisation will also feature distinguished playwright and screenwriter Hugh Whitmore as the scriptwriter and the award-winning Martin Jarvis as the director. To download Part One click here. To download Part Two click here. Once the link get’s pulled I will not be re-upping it.